WIW: Manrepeller vs. the Edokko RESTYLED! What makes an orphan an orphan? What with all the talk lately about dressing in uniform to play the protagonist in your own life, when I saw these pictures, I couldn't help but think of myself as a cartoon character. Grey, white, black. Signature haircut, statement specs, red lippy. Skinny legs and big shoes. Mostly I'm not much of a minimalist. Then there are those days when I forget about what's not there and focus on the rightness of what is. They don't come around very often, because neither do these kinds of quietly perfect pieces that only make themselves known after a few wears. And there's the rub. There is only one of that jumper, found in an atelier shop in Lisbon, and only one of that Jil Sander/+J for Uniqlo shirt. I wish there were twenty, because it is without a doubt the best white shirt for ladies I have ever found, and the piece I will wave in the face of anyone who says chainstores can't deliver outstanding quality. Shoot on the execution, ladies. Shirt in or shirt out? And should my pants be looser fitting? So my much loved mid-price creepers have finally bitten the dust. These are an essential component of my look and have been one of my most worn pairs of shoes in recent years. I want to replace them with a pair of the premium English-made variety by George Cox, which means I have to buy from a supplier in London. 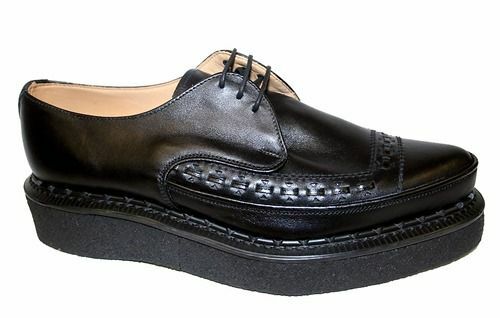 However, English shoes aren't cheap and the Euro is low against the pound right now. I've made a few other investments in wardrobe lately. I've been sticking mostly to my wish list and objectives but it's been an expensive year. It all feels a bit extravagant. - Try to work around the space they leave in my wardrobe and see what else comes up in the meantime. But just look at that full grain leather and stitching detail! I'm pondering Sam Vimes' 'Boots' theory and thinking I should go the extra mile. What do you ladies think? I take a lot of inspiration from various Asian street style blogs. I don't know if this is a good idea because what works on bright young things from Tokyo doesn't always translate to a middle aged English lady. It doesn't keep me from trying though. Today I tried to sharpen up what is probably the most un-fashion item in my possession, a slouchy men's jumper from Scotland. I love this thing. The soft knit and rich colour scheme have a happiness factor that is off the charts, but there's no denying it looks bigger than it is, and that's being polite. So, with the help of this picture of a willowy young man who seems thoroughly at home in oversized knitwear, I'm trying to convince myself that frumpy can be edgy and a chunky jumper works with a faux-leather midi skirt. ETA with pic: I took your advice. Revisiting the look today with a sheer navy button-down shirt from American Apparel and my venerable DvN pleated skirt. I think this works much better. Thanks merwoman and avicennia for the suggestions. I'm closing the week with a little vintage/boho styling. Today I'm wearing an alpaca sweater bought in Peru in 2003, metalic gold pants from ByBrown and my ubiquitous MMM booties. Also wearing my glasses today. I really like these frames by Maryll, a tiny under-the-radar French brand who produce the most beautiful hand-made specs in classic/vintage styles. I'd bat for Team Specs way more often if I could reconcile them with my hairstyle, because the only thing to do is to tuck my hair in at the side in a very nerdy way. On top, a vintage boiled wool peacoat sourced on Etsy. I think it’s probably older than I am. I gave it an overhaul when I bought it, replacing the lining and the buttons. I’ve had several years of wear out of it and I expect a few more to come. It's really warm and I love the military styling. I had a couple of hours to kill in Rotterdam last week when I had it in mind to go to a museum, but it was raining hard and I didn't get very far. Instead I ended up sheltering in one of those impossibly haute-fashion boutiques where all the clothes are black and all the decor is white. The staff must have seen me coming and recognised me as one of their own because they sprang into action as soon as I crossed the threshold. Fortunately there were several clearance rails so I was saved the embarassment of a hasty exit and I negotiated a two for one deal on a couple of pieces from my personal wishlist, a black faux-leather skirt and a pair of black culottes. I've been wearing much more black lately and trying to direct myself towards a more avant-garde modernism without sacrificing my arty eclectic signatures. These two pieces take me further in that direction and I think they're both going to work hard well into spring. Here are two looks with the new acquisitions, contrasted with another look in the same vein. I'm seeing the start of a mix-and-match capsule based on black statement skirts. I'm challenging myself to balance out the unusual proportions with perennial staples and I'd like to bring their sharp modern styling into line with the softer classicism I'm used to. I'm thinking a retro vibe could work for the faux-leather skirt, with a high-contrast fitted/cropped sweater (something like #3) and creepers. 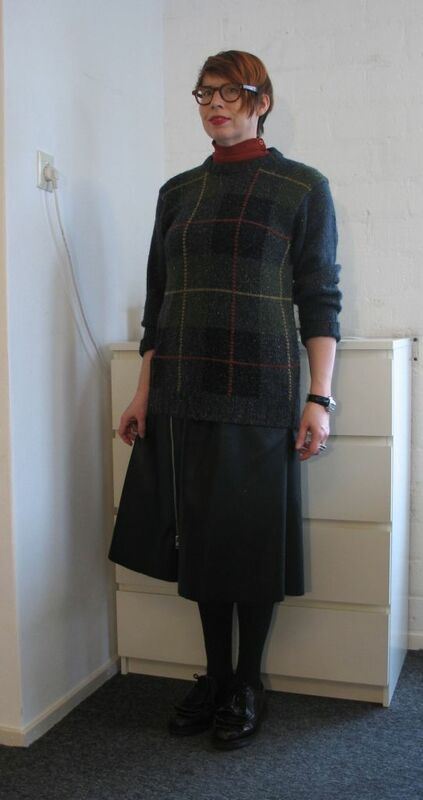 I'm a bit stumped by the culottes though. They work very well with a long fluid jacket as well as the more boxy style I've used here, but I'd really like to wear them with something that gives more definition at the waist and so far nothing I've tried feels very contemporary. I think maybe I'm stuck for reference points because culottes are trending right now after years of absence. 1. Faux leather skirt by Ann-Sofie Back. I'm not usually a fan of conspicuous branding but this is done with the brand's trademark humour. I like the playful merging of the boxing and moto styling with the go-faster strip down the side. I have a few other pieces from this designer already and I like what she does. I wore this day-to-evening on Friday and got a lot of compliments. Layered with the Pitagora cardigan and booties from Topshop. 2. Gabardine culottes allegedly by Comme des Garcons. I got a good deal on these because for some reason they'd lost their tags so I can't say for sure if they're genuine. Whetever they are, the cut, material and finish are nice enough for me not to mind their murky provenance. These look to be the same design in cotton. Worn here with a leather and wool sweatshirt I made myself, metallic leggings from the roller derby, boots by MMM and a Uniqlo HeatTech turtleneck. 3. Pleated skirt by Dries van Noten. I've had this about 10 years and it works hard every winter. If anything, this piece prompted the purchase of the other two, because I know the shape works for me an it made sense to update it now that it's back in style. 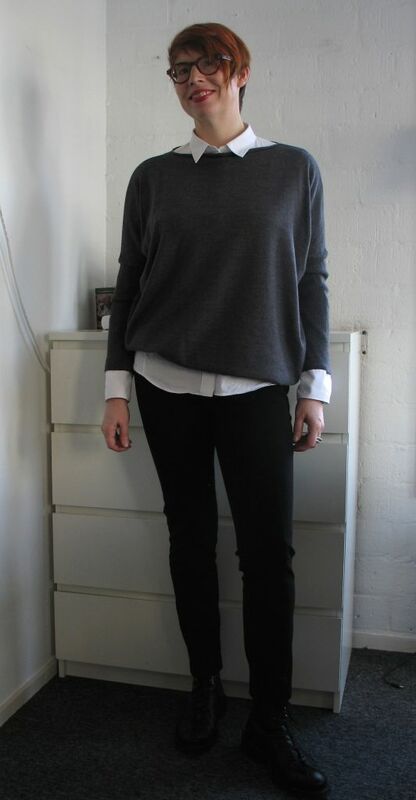 Worn here with Topshop booties again and a Connie Groenewegen sweater. She’s a Dutch designer who’s doing some wonderfully innovative things with knitwear. You can’t see in the photos but it’s blue silk-mix fine knit bonded to black felted angora. It’s quite special. Please tell me what you think, any feedback and further styling ideas are welcome. Thanks for looking! I loved Angie's recent post about orphans, which prompted me to have a good look at a few things that I don't think are getting enough wear. To be honest, although I moan about struggling to style the contents of my diverse and eclectic wardrobe, there isn't really much dead wood in there, and luckily I haven't made too many mistakes in the last few years. For the most part, the orphans at the moment are either things that were in circulation and have dropped out of favour, or things that have some practical pitfalls that I didn't identify before I started wearing them. There are also one or two very nice things that for some reason look wrong every time I put them on. For instance, in the first category right now are three pairs of shoes and a leather jacket in various shades of brown which I used to wear with grey, green, navy or purple. I don't quite know what to make of this, except that I'm not wearing this colour combination very much any more and I should probably hang onto them until I find another palette to make them work. The second category are mainly statement pieces in refined materials that I worry about ruining - velvet, silk etc, or things that would get a lot more wear if I were less panicked about wearing them on the bike. The third is almost impossible to pin down. I have two jackets that I like very much but something about the styling is just plain weird. I wish I could be more specific. Perhaps I should post pictures so you can all tell me. What about you ladies? What orphans your orphans? I've been absent for a while but I'm back now after a short holiday and a slightly longer flu. I'm also sitting on a backlog of pictures, so I'll probably do a couple of WIW's in the near future. But first, here are some pictures of the Raindress, mentioned in a previous thread, for rachylou and anybody else who rides a bicycle and doesn't want to compromise on style in wet weather. By way of full disclosure, I know the designer and was informally involved in the design process in that I assisted with a little R&D and gave suggestions and feedback on prototypes. I've no specific interest in the product beyond that, but I am maybe a little biased. 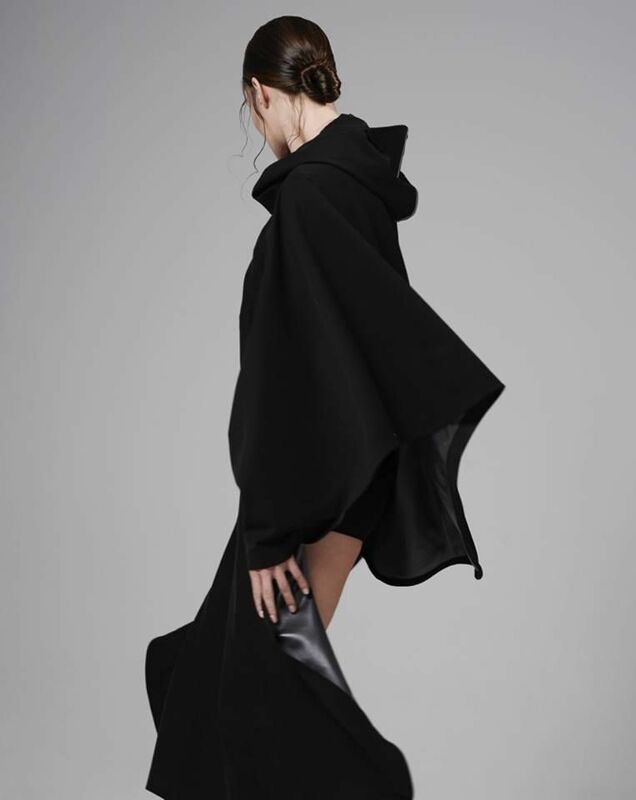 As Mr Edge pointed out when I first described it to him, the Raindress is essentially "a trendy rain poncho", but there's more to it than that. This thing is so ridiculously elegant that it goes way beyond gear. When I put it on for the first time I actually wanted it to start raining so that I could go out and bike around showing it off. To paraphrase the designer, it's all about dressing up and feeling good about heading out on your bicycle in the rain, and if that's not an argument for the transformative power of fashion then I don't know what is. The dress pulls over the head, ties with a sash at the back and fastens under the arms, so it's loose enough to fit over a light jacket or coat. The skirt is long enough to give good coverage and the elastic loops around the legs keep it in place when you're cycling. The loose design gives sufficient freedom of movement and adequate ventilation without too much air resistance. A nice touch are the weighted hems on the skirt and cape, which keep everything from flapping about in high wind. The hood fastens snugly under the chin and the tucked design means that it stays put and doesn't impede visibility when you turn your head. It fits easily over a helmet (I checked!) which is an obvious requirement in environments with no bike-friendly infrastructure, which would be anywhere other than the Netherlands. In general it performs very well in the rain. The material is impregnated poly satin with a breathable backing, all seams are taped and the edges are laser cut for a very clean finish. The whole thing folds into a built-in pocket so you can carry it around when it isn't raining. It keeps me very dry and my only complaint I have so far is that the short hem on the cape at the back means a wet backside if I hop on the bike without first wiping water off the saddle. This is a minor quibble, as my guess is that more coverage in this area would probably compromise freedom of movement in the skirt. So yes. I can definitely recommend the Raindress. If you're an urban cycle commuter and you're fed up with anoraks and nylon over-trousers in bad weather then this is the product for you.